Village of Aviston, Illinois This link will take you to the Aviston Home Page. 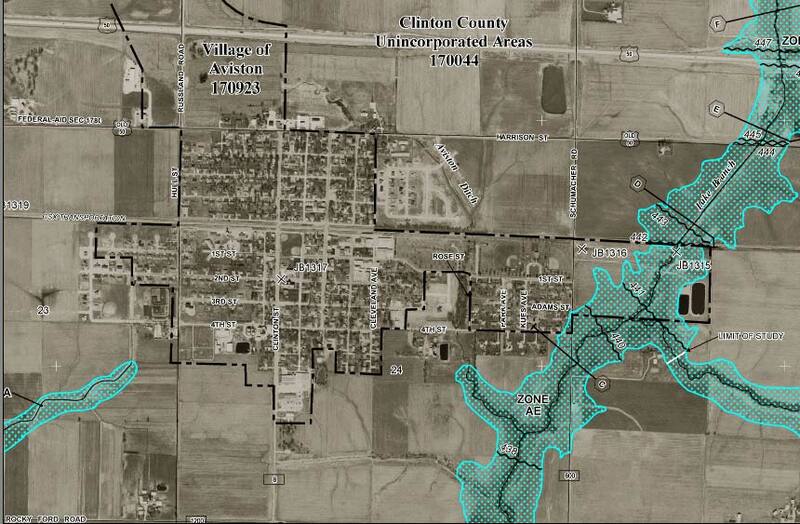 The Village of Aviston Illinois DOES NOT participate in the National Flood Insurance Program! The FEMA map is used in administering the National Flood Insurance Program (NFIP). Communities across the United States and its territories participate in the NFIP by adopting and enforcing floodplain management ordinances to reduce future flood damage. In exchange, the NFIP makes Federally backed flood insurance available to homeowners, renters, and business owners in these communities. The Village of Aviston does not participate in the NFIP. Because of this, you as an Aviston resident are not able to buy the discounted flood insurance through the NFIP for as little as $129 a year. You may buy full price flood insurance, a house purchased for $140,000 was recently quoted for $12,000 a year! $12,000 a year versus $129 a year for flood insurance ? ! ? ! ? ! This FEMA map DOES NOT identify all areas subject to flooding, particularly from local drainage sources of a small size (Aviston Ditch ?). EVERYONE lives in a flood zone. The fact that a flood hasn't occurred within recorded history does not mean one hasn't happened in the past or that one will not happen in the future. New Development and construction can change the natural drainage and create brand new flood risks. That's because new buildings, parking lots, and roads mean less land to absorb excess precipitation from heavy rains. FEMA defines a FLOOD as a general and temporary condition of partial or complete inundation of two or more acres of normally dry land area or of two or more properties (at least one of which is the policyholder's property) from one of the following to include the unusual and rapid accumulation or runoff of surface waters from any source to include rain, a broken water main, and outdated or clogged drainage system.